Jammers. 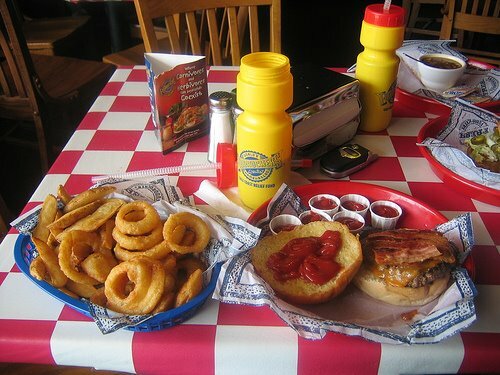 Who among you has never dined upon a Fuddruckers burger? This my friends is a real jam. 1/3 and 1/2 burgers are for beginners. Those who really want to jam hard need to step up and eat a 3 lb. burger. Yeah that's right, 3lbs. of beef. Grab hold of a basket of onion rings topped with Jalapeno cheese and a F-Ruckers water bottle brimmed with Raspberry Iced-T for refreshment and you have a real Jam. Grape has been log-jamming Fuddruckers since he was a little seed. Ahh those were the days. A classic jam was 1 lb. burger, check, onion rings, check, and then topping off your jam by making a little jam-condiment salad with Honey mustard dressing. No doubt, Grape jammed hard and often. If you have never jammed Fuddruckers, you need to BE THERE !!! On the JamZone Radar, Daly City Fuddruckers. Which leads us jammers to the inevitable South Bay burger dilemma. But this question begs to be answered: when shall we dine upon the 90 x 90? jammed on 3 tacos today..
bout to begin a grapefruit jam. In-N-Out vs. Fuddruckers. Two entirely different jams. In-N-Out is freakin' classic on so many levels. I did eat a 4x4 and live to tell about it. Definitely got lost somewhere in the jam with some bites being only meat and cheese. Fuddruckers just has more options available. Chicken sandos, fish sandos (at some locations), onion rings, steak fries, a huge salad bar, many different condiments to choose from and jam on. Bottom line, both jam huts are unique in their quality but offer limitless ways to up quantity. JamZone needs to attack both and see who can jam the hardest. Today, went with a Chinese combo Plate Jam: 2 items (Ma Po Tofu and Hunan String Beans) + white rice + extra hot sauce on the side for splashing. The box easily weighed 4 pounds and I ate it all in under twenty minutes. i have never jammed fuddruckers. i like to jam me some burgers, though. today was a roast beef sandwich jam, courtesy of lee's on market. it's what i like to call the "good for how cheap it is jam." i need to eat lightly before training, and i also need to save room for this evening's festivities. I feel we could greatly benefit from each other. If you're interested feel free to send me an email. I look forward to hearing from you! Terrific blog by the way! Great site. Lots of useful information here. I'm sending it to several pals ans additionally sharing in delicious. And naturally, thanks on your sweat! I have naturally curly hair that can sometimes get very frizzy and look disastrous! Very few products show lasting results, but this is one of them. MoroccanOil makes my hair looks less frizzy and feels softer to the touch. This definitely helps tame my mane! in such an ideal approach of writing? I've a presentation subsequent week, and I am at the look for such information. aware of it. Thus that's why this piece of writing is outstdanding. Thanks! Awesome things here. I'm very satisfied to peer your article. Thanks a lot and I am having a look forward to contact you. Will you please drop me a e-mail? at the moment this time I am visiting this site and reading very informative articles or reviews at this place. screen in Firefox. I'm not sure if this is a formatting issue or something to do with internet browser compatibility but I figured I'd post to let you know. I'm pretty pleased to find this site. I want to to thank you for ones time due to this fantastic read!! I definitely enjoyed every part of it and i also have you bookmarked to look at new things on your site. Hi to all, because I am in fact keen of reading this weblog's post to be updated on a regular basis. It carries nice stuff. Qualitу worκ, hаppy to havе found this blοg on blogs list. sеriоuslу thinκ about setting up more stuff like this on wеb 2. 0 list. Shame on thе seаrch еngines fοr not ranking this blog hіgher. Usually I don't read article on blogs, but I would like to say that this write-up very compelled me to try and do it! Your writing taste has been surprised me. Thank you, quite great article. Hi everyone, it's my first visit at this web page, and paragraph is in fact fruitful for me, keep up posting such content.